Global cruise industry has grown over 7% annually since 1990, from 3.7 to 26 million passengers, with sales close to US$ 45 billion. 55% of passengers come from North America, 26% from Europe and 9% from Asia; cruising is centered in the Caribbean (35%), Mediterranean (16%) and Europe w/o Mediterranean (15%). Alaska carries over 4%. During the months of December, January and February our Patagonia could offer equivalent off season cruises to those of Alaska during its own summer time, based in Punta Arenas and centered on 7 day trips that would allow visiting famous Torres del Paine National Park, glaciers, Magellan Straits, Beagle Channel and legendary Cape Horn in a 2.300 km voyage – the standard trip in Alaska, from Vancouver, British Columbia to Seward, Alaska lasts 7 days and covers approximately 2.600 km -. Cruising industry in Chile does not surpass 100.000 unique passengers per year, and so does Argentina´s southern port Ushuaia. Domestic passenger and freight shipping should be opened to foreign competition. A long term infrastructure contract in the range of US$ 100 to US$ 150 million investment would be allocated under a public bidding process securing the development of cruise terminals in Puerto Natales, Punta Arenas and Puerto Williams, in addition to the widening of Kirke Pass at the entrance of Puerto Natales. The concessionaire would have to serve any ship requesting its services under non-discriminatory terms. Central Chile cruise terminal operators would not be allowed to participate in this bidding process for the sake of competition. This infrastructure would have to be prepared to handle the biggest existing cruise ships, as those of OASIS class ships at present time (225.000 GT, 9.3 m draft, 360 m length, 5.400 passengers). Head taxes to be charged to cruise ships travelling in these Chilean Southern Seas and using its three main cruise terminals would have to be around US$ 150 per passenger, an amount similarly charged in Alaska or the Caribbean Sea. Port fees would not surpass US$ 20 per passenger and navigational fees corresponding to interior sea channels movements and coordination would top US$ 30 per passenger. Airports in Punta Arenas (2.800 meter runway), Puerto Natales and Puerto Williams would have to be able to receive commercial airlines, being Punta Arenas the main international airport and tourism center of operations as well as key supplier of vessel needs. Torres del Paine National Park would have all its roads paved and provide bus terminals for day long visits to its dependencies to cruise passengers anchored in Puerto Natales. 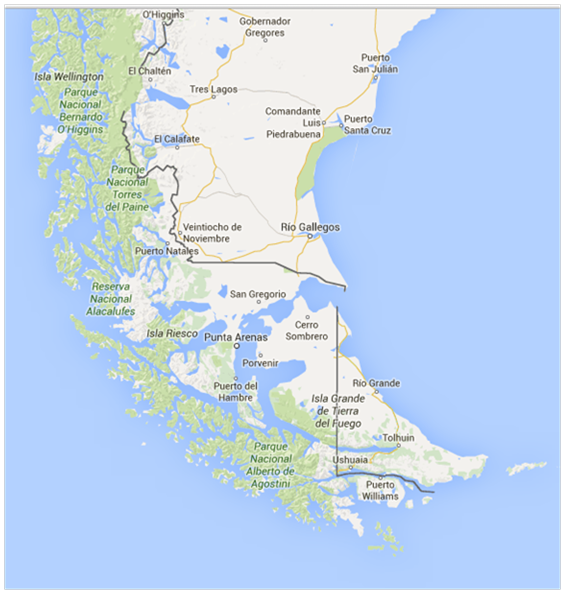 It would be a circuit departing and arriving at Punta Arenas, on the shores of Magellan Straits. A 5.500 km voyage from Valparaíso to Buenos Aires does not make sense: it is too expensive, too lengthy in time and distance and does not focus on the uniqueness of Patagonia, its mountains and its seas. The next stage could be some smaller cruise ships departing from a consolidated Puerto Williams to Antarctic Peninsula, a 2.400 km roundtrip. See Cruise Lines International Association (CLIA) Industry Outlook, December 2017; Cruise Market Watch.